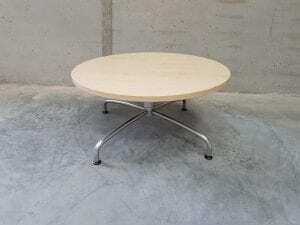 This circular maple coffee table is perfect for use in a meeting room, breakout area or reception area. Sitting on a stylish, brushed chrome single stem base that includes a trendy spider style feature, this table will definitely make a statement! If you would like any further information, please contact one of our sales team on 07944 508282. Or, just click on the Telephone Icon located at the bottom of this page on your mobile device. As always, you can view this table in our showroom along, with all our other used office furniture.